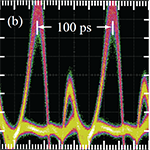 Authors: Apiratikul, P.; Astar, W.; Carter, G. M.; Murphy, T. E.
Abstract: We demonstrate the simultaneous conversion of wavelength and nonreturn-to-zero to return-to-zero (RZ) format at 10 Gb/s, using four-wave mixing in a passive GaAs bulk-waveguide. A conversion efficiency of -28 dB (idler output relative to signal output) and a conversion bandwidth of 48 nm could be achieved in this waveguide, which was fabricated in a single photolithographic step. The conversion efficiency is also characterized and compared with simulated results. The converted RZ on-off keying (RZ-OOK) signal demonstrated a 1e-9 bit-error-rate receiver sensitivity penalty of 1 dB relative to baseline RZ-OOK.